The extraordinary moment of Parícutin's birth was first witnessed by a group of Tarascan Indian farmers. Their testimony leads off the comprehensive collection of reports in this benchmark study of a unique geological event. For the first time, the editors have brought together dispersed geological reports along with photographs, sequential maps, and cone profiles that follow the progress of the eruption. Reports on the effects on the local population and their resettlement are included, as well as reports on the biological consequences of the eruption. As the definitive book on Parícutin, the geological, sociological, and biological sides of the story are covered through reprintings from 49 classic studies of the eruption that includes the work of Foshag and González-Reyna, Wilcox, Ordóñez, Rees, and Nolan. "This bargain anniversary book is a well-made tale by two Smithsonian volcanologists with a gift for narrative." -- Scientific American. 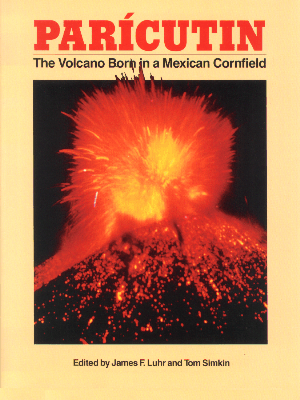 Luhr, James F., and Simkin, Tom, 1993, Parícutin: the volcano born in a Mexican cornfield: Geoscience Press, Phoenix AZ, 427 p.
These are no longer for sale, but may be found on the secondary used book market.